inches in the ground. When I should be looking over our onion field with row after row of beautifully-spaced and maturing white bulbs, I instead see a forest of green going to seed. We got to this place this year from a wet spring which continued into early summer. 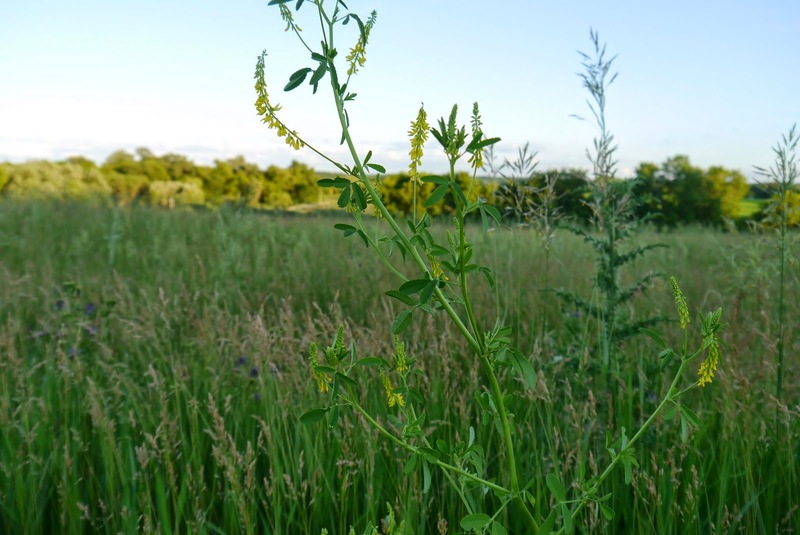 Oftentimes people think the major issue with lots of rain is that it sets back planting, but, on an organic farm like ours, the biggest challenge with a long, wet season is the inability to control weeds. 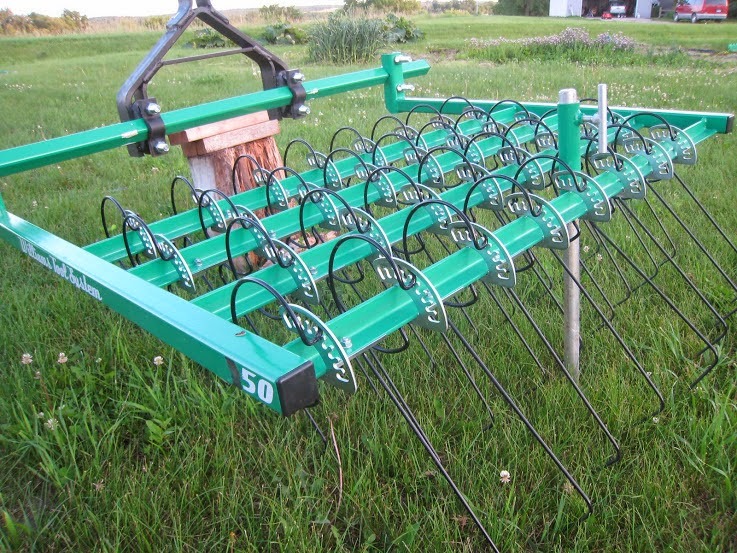 We use mechanical cultivation to take out weeds when they are just emerging. Our cultivation equipment consists of an old Farmall H with shovels attached and a tine weeder which drags over the bed. When not even able to walk on the totally saturated soils in June, we sure were not able to drive a tractor out there, and, once a full flush of weeds germinated at got to a good size, tractor cultivation doesn’t do a great job of killing them. So, it’s come down to us, a lot of time, and our hands. After a few weeks, I feel we are starting to win this war of attrition as we reclaim territory row by row. It certainly is a great sight when I get to the end of a bed and can look back over the uncovered plants – ah, relief! Recently rescued crops include the second planting of beans and a pretty bed of carrots. It was nice to see some members last week who came out picking peas. But I know a lot of members still haven’t been out. Please know you are welcome and I’d be happy to show you the sights. Got kids, maybe they’d like to see the pigs or give Peanut, the milk cow, a leaf of hay? If you are in the neighborhood, stop on by. Sunday’s are typically good as we are almost always around. I hope you’ve been enjoying the “early season” veggies (hard to believe I’m saying that at the end of July). I saw some cherry tomatoes turning in the high tunnel a couple days ago and melons starting to swell on the vine. Over the next couple of week, expect to start making a transition to high season as corn, tomatoes, and peppers begin to ripen. Green Beans: Most of these are a variety called Grenoble I really like because of their dark color and waxy texture. Place cucumbers and onion in a large bowl and sprinkle with 1 teaspoon salt. Let stand one hour. Drain. Add yogurt and dill and serve. 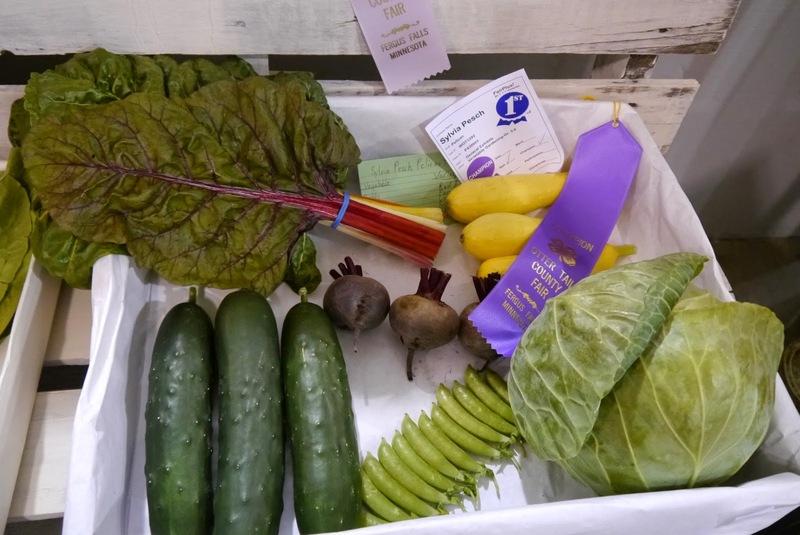 When our daughter, Sylvia, was asking about what to bring to the fair, our obvious answer was “vegetables.” Being that this is the first year she could show and place (she graduated from Cloverbuds), it took us a bit to figure out exactly how to present the veggies for the fair. We read through this publication Extension put together back in the 70’s – an oldie, but goodie, I guess. Then, Tuesday morning, we trounced out to the garden to pull in a assortment consisting of a cabbage, peas, cucumbers, beets, swiss chard, and summer squash. Maree and Sylvia must have a good eye because she was awarded champion at the West Otter Tail County Fair. One neat thing about the kids now getting into 4-H and the fair is that they are picking up on a long family tradition started with Maree’s great-grandfather, Charles Goetschel. Settling in Lake Elmo in the 1840’s, Maree’s family operated a diversified dairy operation up until early 2000’s; I always say Maree grew up at the last remaining dairy farm in Lake Elmo, although I really don’t know if that’s true. Apparently these guys were fierce competition at both the Washington County Fair and the State Fair, especially in field crops. Maree’s mom passed on this little clipping from the 30’s about her grandpa Wally in his last year of 4-H. Bunch of Cilantro: One with a red band around it. Cook the beans in a large saucepan of boiling salted water until nearly tender, about 6 minutes. Drain them in a colander and refresh under cold running water. Drain well. In a medium bowl, combine the olive oil and lemon juice and season with salt and pepper. Thinly slice the fennel lengthwise, add it to the bowl and toss, then transfer the fennel to a platter. Add the beans to the bowl and toss with the remaining dressing, then transfer them to the platter. Garnish with the Parmesan shavings and serve. We’ve finally reached one of my favorite times of the year: haying season. I was a long time coming because of the rain, which has been messing with everything this year. This has caused the fields to become overgrown and unruly. One thing I most appreciate about hay cutting is the feeling I get when all the bales are being driven to the barn loft for stacking. Looking back over the field, everything look so clean; together with smell of the baled hay, and you really have a rich feast for the senses. . I liken it to vacuuming your house or even getting your hair cut. For just a little while, all is in order and you can sit back and appreciate. We actually have a lot going on in the fields and pastures this year. In our front hayfield we currently have 5 pigs who will be assisting us in working up the field. If there’s one thing hogs like to do, it’s rutting in the ground. Since we’re running out of space for produce, we need to utilize that field, which probably hasn’t seen anything other than bromegrass for about 20 years. I’ll first chisel plow the field and later we’ll let the pigs loose on it! Nice thing is that they fertilize while they work. Starting this spring we now have a family milk cow in the back pasture plus a calf – exciting because bovines are new to us. Throw in the bees behind the barn and our small flock of sheep, there’s a whole lot of life going on out there! Like the pigs working up the front field, the key to all these animals on a vegetable farm is that they integrate well into the operation to support the fertility of the fields so plants are healthy, and, in turn, the crops feed the animals. It’s a beautiful thing. Basil: Please don’t refrigerate unless you like black basil. There are two schools of thought to keep basil. One, treat it like a flower; cut the end and put in a shallow vase. Two, wrap in a damp paper towel and keep in an open plastic bag to retain moisture. Strawberries: These aren’t the prettiest of berries, but I think the flavor’s there. Kohlrabi: Funny looking bulb. Many simply peel, slice, and eat raw…can be added to salads like a radish. 1 onion, thinly sliced: In a large frypan saute in 1-2 T olive oil over medium heat until brown and crisp, not just soft. Remove to a serving dish. 1 bunch of fresh kale or swiss chard: Stack leaves, roll together and slice about 1/4 inch thick. Saute in frypan for 1 minute. Several tablespoon and 1/4 teaspoon salt to taste: Add, cover, reduce heat and steam until tender. Add water as needed. Kale cooks in 10-15 minutes; swiss chard cooks a bit faster. When greens are tender, drain in colander. Return onions to pan and heat to sizzling. 1 T tomato paste: Add and stir. When this mixture is hot, return the greens to the pan. Mix, heat through, and serve.